There's not to many, even in Ireland who can rhyme off the names of the nine glens of Antrim, so just for you here they are. 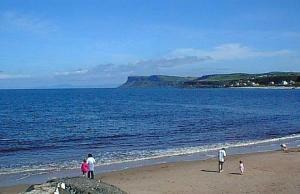 Most of them can be reached from the beautiful Antrim Coast Road which starts off at Larne and heads north. 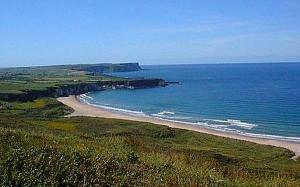 Close to the Giants Causeway White Park Bay is a popular spot on a summer's day. In the distant horizon the coastline if Scotland can be seen. There is a car ferry which runs from nearby Ballycastle to Campbeltown in Scotland from mid June to late September. The journey takes 2 hours 45 minutes. A shorter boat trip takes you to Rathlin Island an haven for birds and seals. In the Autumn Ballycastle is the home of the famous Auld Lamas Fair which used to be a hiring fair. Don't forget to buy some "Dulse" (dry seaweed) and "Yellow-man" (sweet honwycombe) if you go. Nearby to the west of White Park Bay you can find Dunseverick Castle which was believed to be the centre of the Kingdom of "Dal Rriada." Saint Patrick is thought to have visited the castle in the 5th Century. I lived in the wee place called Port Braddon at White Park Bay, and ours was the first house as you come down the hairpin bends. "Carrick Inan" is its name and it must be close to 400 years old now. Always filled with laughter and animals (our own as well as strays) and music, I lived with my parents and beloved Aunt Ivy. In Spring, the farmer McCurdy's cows from up the road used to love our big front lawn and let themselves in through the latched gate, leaving great soggy hoofprints over my dad's pride and joy and eat my mum's just sprouting flowers, taking no notice of our (untrained) sheepdog Queenie's increasingly outraged efforts to herd them up the road! In Summer, the doors would be flung wide and Ivy's piano playing could be heard clear across the bay to Ballintoy. We'd spend the long summer and autumn days outside in the garden, or on White Park Bay. I clearly remember picking blackberries in autumn and coming home black-stained, tired, scratched and happy, to find sterilised jam jars all glistening and waiting for jam-making. In winter, we would snuggle happily under Carrick-Inan's protective roof and watched the snow lay thick white blankets over everything, turning our garden into a faeries' grotto. The icicles hanging from the cliffs above the hairpin bends were bigger than my dad - and to a little girl, that was pretty big. Relatives, neighbours and friends would arrive unannounced to join us for 'a wee Sherry' or a glass of old Bushmills (Dad worked at the Bushmills Distillery). Out would come the accordion and with Ivy's piano playing, the songs and laughter would have me dancing and singing along with the adults. It was always so sad to have to go to bed and leave them to it. My childhood up to the age of 7, was filled with fairies and long golden evenings, playing around the lupins, splashing in the back garden burn, going out in the boat with my uncle, Bertie McKay (who still lives at the 'Moorings' - the house on the other end of Port Braddon) and catching great boatfuls of slivery, splashing salmon that left me covered in silver scales. I never missed a chance for that boat ride and remember one particular occasion when the sea was in mountains and my mum strictly forbade me to go down to the jetty, let alone in that fragile old rowing boat. Of course I disobeyed and nearly caused an collective family heart attack by almost disappearing over the stern whilst eagerly watching a large conger eel swimming by! I don't know who was more frightened - my uncle or me - of my angry mother awaiting us at the edge of the jetty on our return. Needless to say, I got a thrashing to remember, my uncle a tongue-lashing he'll never forget and my mother got a particularly large salmon for her troubles! Queenie and I used to traipse for hours (I was about 4 then) along White Park Bay, often alone as she was the best nursemaid anyone could wish for. We'd find stranded eider ducks and bring them home (once, it was a bad tempered, smelly seagull with a broken wing that took a bite out my hand). On the opposite side, of Port Braddon, past the 'Fishery' was a rocky pathway to the top of the headland and the 'Hole in the Rock' . Standing in 'the Hole', a breathtaking view spread itself down below, of the 'Blue pool' and craggy bay as it swept around to Port Moon, where my other uncle Archie McKay also ran a fishery. There, the old airstrip from World War 2 was cracked and coloured by gorse and heather and the wind blew cold across woolly sheep. Sadly, my golden days became memories when, at the age of 7 I left Port Braddon to live in Zimbabwe with my mum. 9 years later, through sheer wilfulness, I returned to study A Levels at Friends School in Lisburn. The first thing I did on coming home, was to hug the corner of Carrick-Inan - a gesture that became a family tradition each weekend on my return from school. My dad died first and then my aunt and by that stage, I was living here in South Africa and engaged to be married. 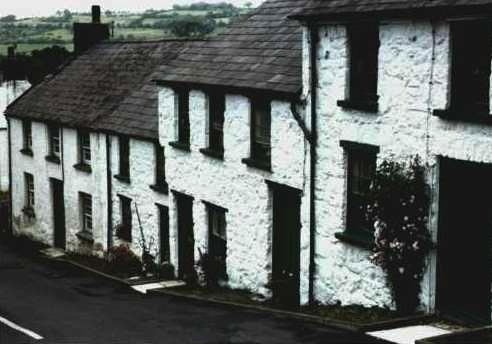 When the letter arrived saying Carrick Inan was now mine, I listened to the voices of others and not my own. Carrick Inan is mine in possession no more, but in my heart, it will always belong to me. 10 years of living in South Africa is coming to an end and I now mentally prepare myself to return to the place where I have always belonged and been free. Ireland. It is true, once the spirit of Ireland is in your blood, it will always call you home. Situated at the foot of Glencloy the lovely old harbour of Carnlough is still a haven for many small fishing boats. The village owes a lot to Frances Ann Vane Tempest "The Marchioness of Londonderry" who started a limestone quarry the village in 1855. A narrow gauge railway transported the limestone to the pier. From here it was exported to nearby Scotland. The Marchioness lived in a fine blackstone castle type mansion called "Garron Tower" on a nearby clifftop at Garron Point. The view is majestic. Grain Tower is still a beautiful building and is now the idyllic home for a first class boarding school. 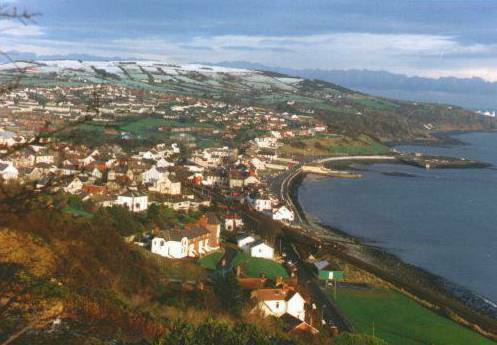 Picturesque Whitehead sits quietly on the north side of Belfast Lough between Carrickfergus and Larne. There is a beautiful walk around to the lighthouse and the 250 foot high Gobbins cliffs are nearby. These old houses can be found in Glenoe. It's a quiet wee place on the back road between Carrickfergus and Larne. It has a beautiful waterfall and a place that makes ice-cream.